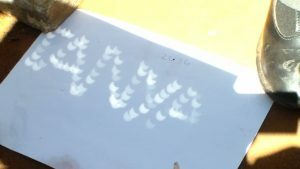 The partial solar eclipse on 2017 February 26 was a spectacular event. Photographs taken by ASSA members and others appear below, followed by the original announcement page. Please submit your images to the Shallow Sky Section. (above) Seen from the 13th Southern Star Party at Leeuwenboschfontein in the Klein Karoo. More images on Auke Slotegraaf’s website. For a short time, the Moon will pass between us and the Sun, and instead of seeing the Sun as a round disc, it will have a “bite” out of it. This “bite” is the Moon, and the size of the “bite” changes as the Moon slowly moves along in its orbit. This eclipse is visible from south-western Africa. If you are anywhere within the shaded region shown on the map, you will see it. The closer you are to the thin darker “centre line”, the deeper and longer your eclipse. If you are lucky enough to be somewhere on the centre line, you will get to enjoy an annular “ring of fire” eclipse! For more detailed predictions, visit the Moonshadow Mix website, which has details for the 40 African countries that see the eclipse. StarPeople are hosting a viewing event at Leeuwenboschfontein, during the 13th Summer Southern Star Party, in the Klein Karoo. Contact Auke 074 100 7237. Mafikeng, the Physics Department at the North-West University has invited the public to join them on Sunday 26 February. They will be between the Old Science Building (A4), the swimming pool and the soccer institute from 17:00. Solar viewers, a telescope and camera will be on hand. Please check weather conditions before going out. 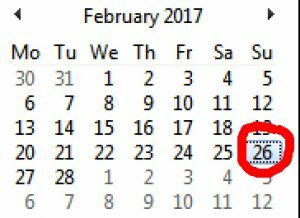 The eclipse is late Sunday afternoon, 2017 February 26. The Moon will take roughly two hours to move across the Sun, and the exact time when it is best to look depends on where on Earth you are. 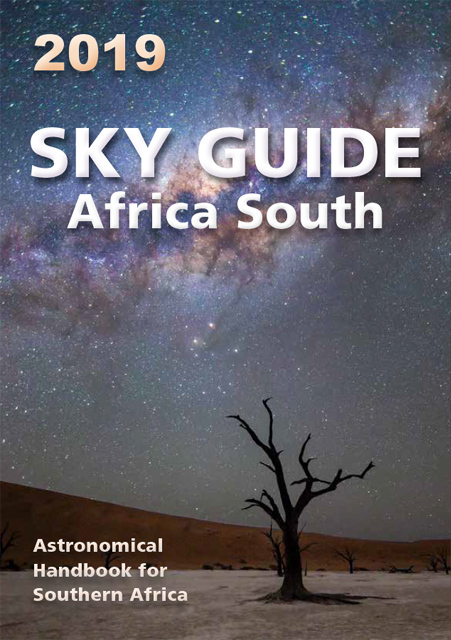 Roughly speaking, around 6pm SAST is maximum eclipse for Southern Africa. But it’s a lot of fun to watch as the eclipse progresses. At first, only a tiny bit of the Sun is eclipsed. 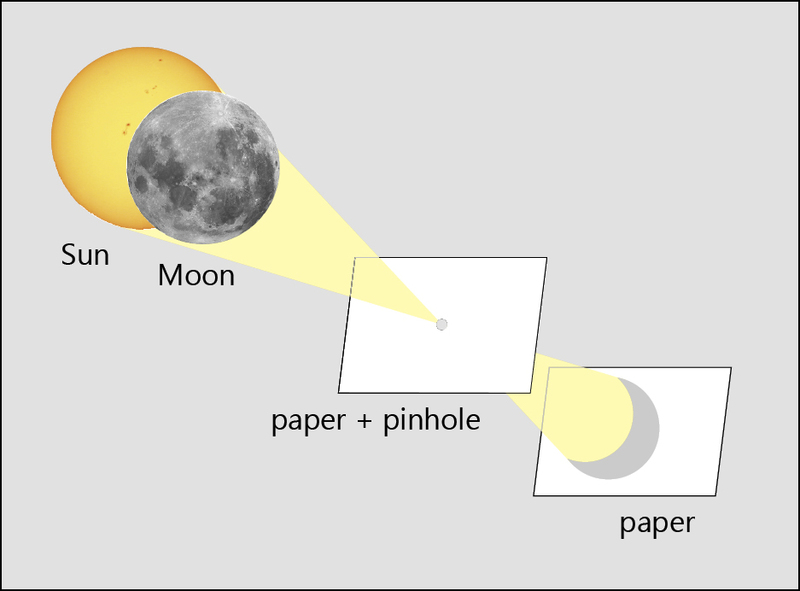 Then, as the Moon moves along in its orbit, more of the Sun is covered. Depending on where you are, a greater or lesser proportion of the Sun will be covered. Eventually, the Moon moves away and the Sun is completey uncovered again, although for eastern southern Africa, this will happen after the Sun has set. The table below gives the start, maximum and end times of the eclipse, in local time, for selected places across Southern Africa. The last column gives the percentage of the Sun’s diameter that is covered at the time of maximum. 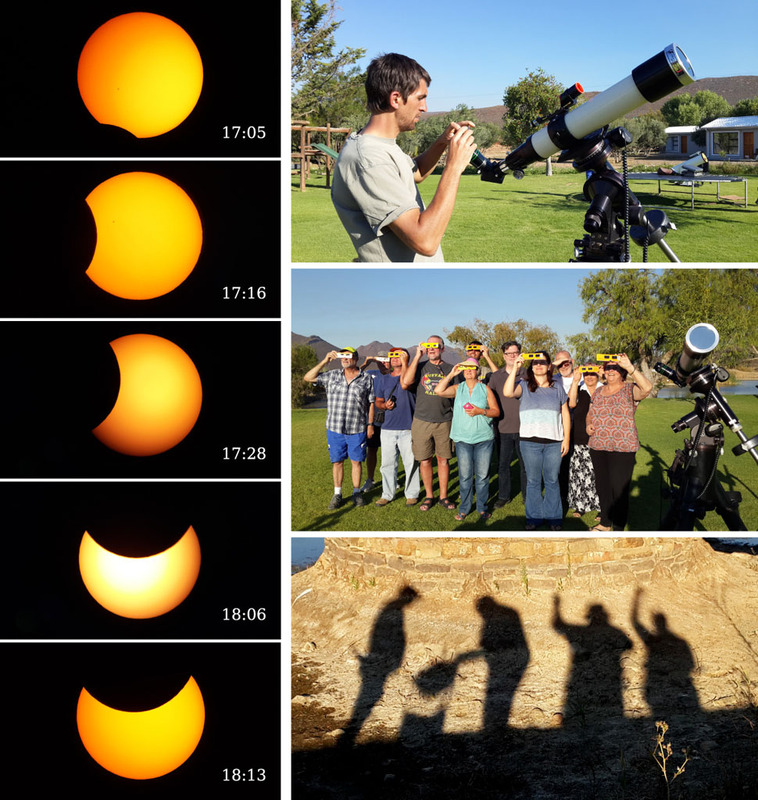 For example, from Cape Town, the eclipse starts at 4:58pm and ends at 6:55pm; at most (at 5:59pm) about half (52%) of the Sun’s diameter will be blocked by the Moon. If it is raining, you obviously won’t see anything! If it is cloudy, you may still have a chance. But hopefully, the skies will be clear and the Sun will be shining brightly. The accompanying photo, taken by Simon Fishley during the 2009 eclipse, is a good example because it was taken in the dark shade under a tree, so the pinhole-projected Sun is bright. 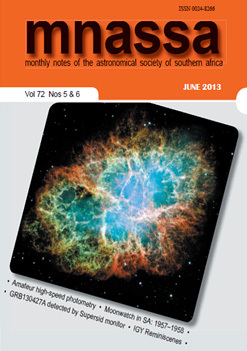 Selected images will be added to the ASSA image gallery. Think about where you will be on the afternoon of the eclipse, and if the venue is suitable (e.g. 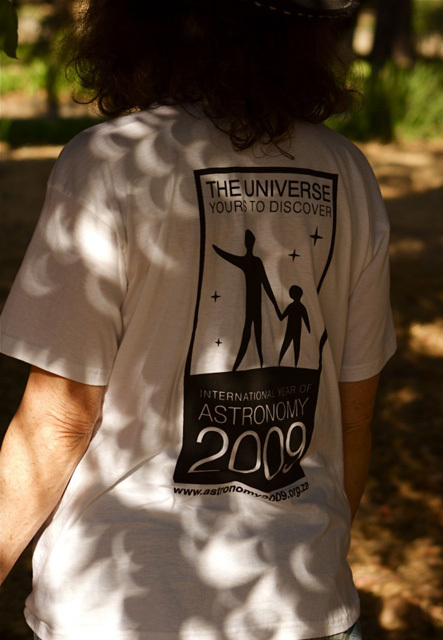 safe, accessible, clear view of the Sun, a suitable tree for pinhole projection, etc.). If possible, do a test run, too, with all the equipment and materials you’ll need. 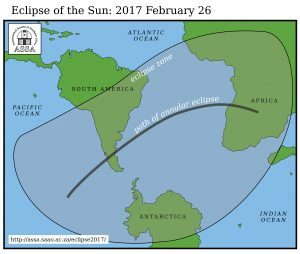 The next total solar eclipse visible in southern Africa will be in 2030. 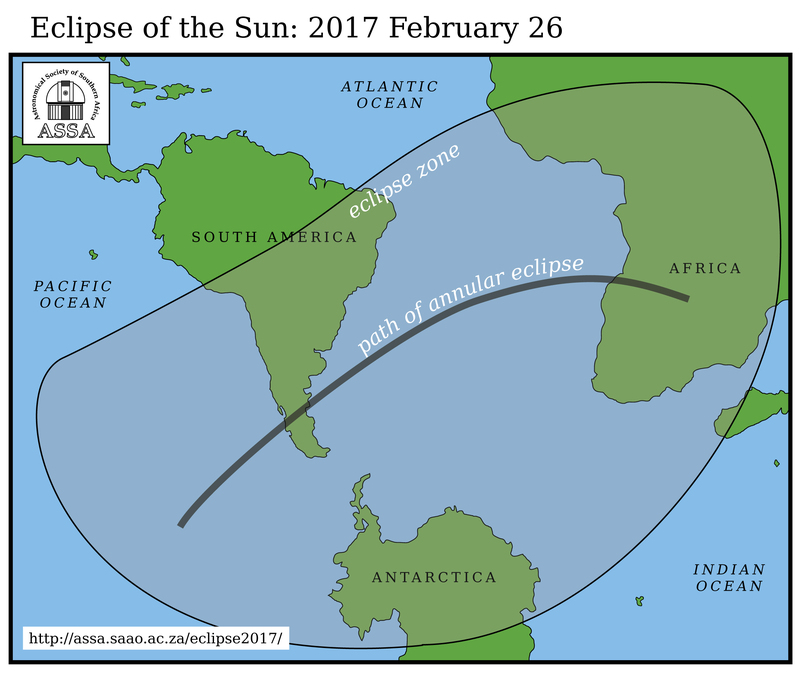 The next partial solar eclipse visible from southern Africa is early in the morning of 2020 June 21. The next lunar eclipse is on August 7 2017 (from 19:24 to 21:19 SAST). However, the Moon passes through the edge of the Earth’s shadow, so this will be a partial (25%) eclipse.